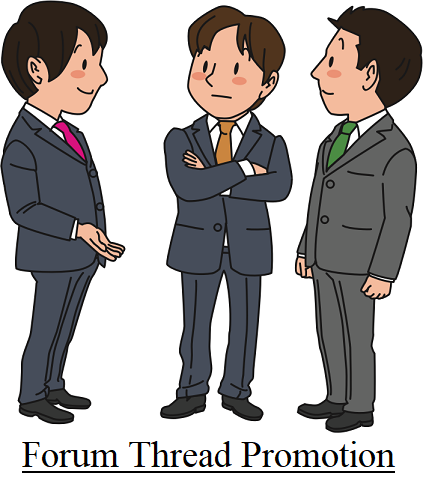 I will create a thread on a forum I moderate that promotes YOUR website link. It can be your own site or a referral link, BUT it must not be a scam site or HYIP. You MUST contact me with your link BEFORE placing an order to make sure your link is ok to promote. - Your link stays up FOREVER, as there is no time limit. I create the thread and it stays there forever. - I post your link in 2 formats: one is clickable for the forum members and the 2nd is a plain text link that only guests can see. The advantage is that you get forum member traffic AND organic search traffic! - Since I am head moderator I can control the content and make sure no one tries to ruin the thread by hijacking it, spamming, etc. - The forum is active so your thread will receive many views per day! This is a unique service not available anywhere else on SC, as there are lots of forum posting services, but none for creating promotional threads that will never be deleted. NOTE: I take my reputation seriously, so I will NOT promote anything crappy, nor will I spam the forum, so spaces are limited. Contact me FIRST to see if I can help you. Forum Thread Promoting Your Website Link is ranked 5 out of 5. Based on 2 user reviews.